Lori is our hostess this week! Well, Christmas has come and gone once again. However, I still have cards to share (as well as some to still finish). I tried my hand at foiling with Deco Foil and a laminator this season. I thought one was perfect for this challenge as I foiled the background and it's super sparkly! 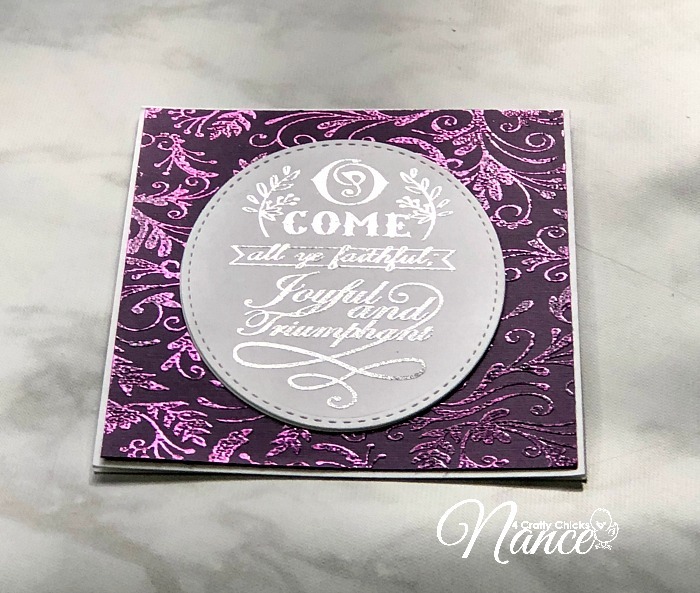 I stamped the sentiment in Versamark and embossed with silver emboss powder for even more shine. It is hard to photograph, however, to show all the glitz and shine. Now stop by the Hen House and check out all my fellow Chicks' sparkly projects! Then link up your own sparkly or shiny project and play along with us! I know how much it shines because the one you sent me is awesome! Can't wait to see how you do it! So, so elegant! So much shimmery goodness! Gorgeous job Nance! Beautiful card! Thanks so much for including our Deco Foil! Happy New Year! Love the color, so rich, and pretty, way to go on this card! !